First form and final form stations from the final tooling design— Boehm developed and built a12-station progressive die in 12 weeks, lower in price than the original tool set and which runs faster and uses 20 percent less material than did the previous process. stamping die and process supplying parts to a North American automotive OEM, so that the work returns to North America. In Boehm’s case, the job revolved around a set of five single-hit dies developed offshore that had been used to produce a pair of brackets. The process had been failing in many areas—making the parts to print had resulted in splits and cracks, so the toolmaker had to enlarge a critical part-feature radius by 3 mm. 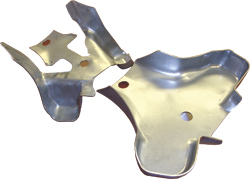 The hand-transfer stamping process required five different press operators and an inspector. And, the 40- to 65-percent rework rate became unacceptable, so tooling changes were required. The carryover part—not being manufactured to original print—had to be re-PAPP’d, and the OEM asked Boehm to take it over and redesign the tooling to get the part back to print. It requested a timeframe of 18 to 20 weeks to get the tooling ready for production, in order to meet a 5-yr. program at 300,000 parts/yr. “We needed quick turnaround when testing our ideas to redevelop the job into a progressive die,” says Boehm engineering manager Joe Krish. To shorten process-development time, the firm turned to FormingSuite stamping simulation and nesting software from Forming Technologies Inc. (FTI), Burlington, Ontario, Canada. “FormingSuite accurately depicted any problems we would likely have encountered on the shop floor, without having to spend time and money to prove out our tooling concepts,” says Krish. “The software saved us at least two weeks on the front end of the project, and also easily accommodated any engineering changes necessary along the . Every problem that FormingSuite revealed in simulation we experienced with the prototype—thinning, splitting and wrinkling,” adds die designer Don Mikuluk. FormingSuite FastIncremental simulation of the problematic first form station. The red highlights show the split in the material. 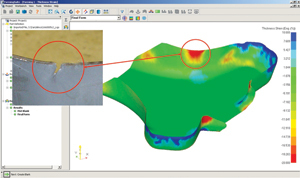 To the left is a digital photo of the same location of the split in the prototype part. comprises several software modules, including FastBlank for developing optimal blank geometry based on material stretch and deformation; FastForm Advanced for zeroing in on the forming conditions such as blankholder force, draw-bead placement and use of pressure pads; FastIncremental for detailed, LS-Dyna based formability analysis and simulation; and ProgNest for nesting blanks on progressive die strips to optimize material utilization based on coil width and pitch constraints. In the end, Boehm developed and built a 12-station progressive die in 12 weeks, well under the original timeframe, lower in price than the original tool set and which runs faster and uses 20 percent less material than did the previous process. And, the tool makes the brackets to original part-print dimensions. Information provided by Forming Technologies Inc., Burlington, Ontario, Canada: tel. 905/340-3370; www.forming.com.